I have some children that cannot segment sounds. I have tried almost everything I can think of and they still don’t understand what to do. 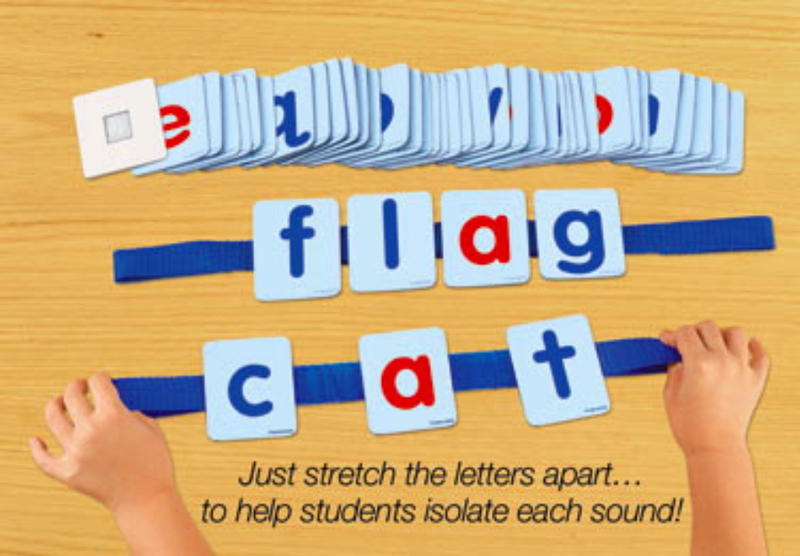 The stretch puppets in the phonemic awareness resource book have always worked for me. There is a snake, dachshund and alligator. Say the word as you go across and ask what is at head, stomach, and tail. Also 3 kids in a line or touching head waist then feet. Nancy, does that help your ESLs too? I use a similar “stretch” strategy but the words are written across a racetrack, and students use a car to drive across the sounds slow, then faster and faster until it makes sense. Once they conquer reading the word, I give them a blank racetrack to write in their own words when I say them aloud. A strategy called Say It Move it works great. You say a word then the students say the word. Then they move a manipulative down as they say each sound. Have them slide their finger under the manipulatives and say the word. No letters are used. Try using Elkonin Boxes. They’re always very helpful to my students. I also tell the kids to say the word in “slow motion” as they are segmenting. We also use the Wilson Fundations program which teaches “tapping” each word out to segment (tap thumb-pointer, thumb-middle, thumb-ring,.. – one tap per sound). You can break apart the sounds into boxes. Then the students can use their pointer finger to “touch” each box (sound). Or you can use manipulatives to “move” each part in each box as the child says the sound. I think there is a tool you can buy, but I just make my own boxes….lots cheaper! We use Elkonin grids much like the ones seen here… https://www.google.com/search?q=elkonin… We use the grids much like the way Cheryl does, and we have great success. I have my kiddies put hands on their head, hands on shoulders, hands on hips for each sound. The parents get a kick out of it too. I use a “counting fist”. They hold their hand up in a fist and hold up one finger for each sound: c-a-t…..cat. I also ask them to identify how many sounds. I model first with the words, then we do it together, and then they do it on their own as a group. I call on random kinders to do it when I see them not participating. Build the word. Palm up is the wood. Other hand fisted is the hammer. Hammer each sound by hitting fist on Palm. Then say the word as you brush it off by swiping palms together. Just keep trying and don’t give up. It just takes some kiddos a really long time to get it. (No matter what your pacing guide says. My kiddos love gooey things. We occasionally will use shaving cream, cooked spaghetti noodles, etc. If they aren’t ready to write the words themselves you can write the word in the s.c. For them and then have them trace it as they say each sound. Pudding works too! I use sound boxes and also slinkies. They also use pretend rubber bands to stretch sounds and then they snap the word together. I get the plastic slinkies from the dollar store or party favors aisle. I call the “word stretchers.” We stretch the words out together sound by sound then push it back together. Repeated practice with several different methods pays off in the end as light bulbs will start to turn on. Don’t give up! We do karate chopping. The kids stand and use their hands to chop apart the sounds. They love it….I make them bow to me because I am their sensai and we tighten our belts and chop. Also a GREAT APP CALLED MONTESSORI CROSSWORDS works well and the kids never get tired of playing it. Have you tried the use of Elkonin boxes for segmenting? Also take 5 unifix cubes that are snapped together and have the kids take a unifix cube off for each sound they hear in a word. You can also do this with jumping or clapping. Have them jump or clap for each sound they hear. Above all though, the Elkonin boxes are a very well used strategy in the research to teach children about segmenting. Start with 2 phoneme words, then move gradually to 3 phoneme and 4 phoneme words. And start with continuous sounds like /m/, /r/, /s/. They are easier to segment. I use colored tiles (green, red for 2 phonemes; green yellow red for 3). They tap or push for each sound. Just keep modeling and having them repeat. And make sure they can segment syllables! If they can’t do syllables then definitely go back and work on syllables first. Totally agree with Karen! Some may even need to go back to counting how many words in a sentence. I had a child come to me in March from another state (I am in VA) and he had to start there. I felt like I was going backwards, but once he got counting words in sentences, then syllables, and phonemes came quickly. Sometimes a step backwards helps with making steps forward!